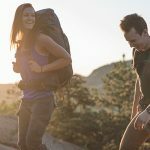 Though Deuter’s ACT Lite packs are somewhat conservative in their feature set, they combine a highly adjustable harness with intelligently tweaked classic functionality to create versatile trekking bags. The 40+10 can accommodate heavy loads with ease and was among the most comfortable packs in our tests. Terrific padding, a generous hipbelt and amazing adjustability all contributed to best-in-class comfort rating. Robust x-style aluminum frame and well-designed suspension combine to provide huge carry-capacity while maintaining excellent mobility. 50-liter internal volume put this bag near the top of the category, but its exterior carry-capacity was minimal. 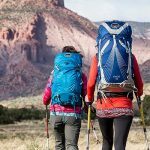 With some strap-additions and a little light rigging, this ACT Lite pack could support true multi-day loads. Access to the main compartment is standard for a pack this size, and while we appreciated the available organization, some users wished for a second hipbelt pocket. While most of its features were well appointed, the ACT Lite’s attached lid and fiddly cordlock at the expansion collar were minor annoyances. Lightweight stretch-mesh on the exterior was somewhat fragile, though not catastrophically so. Excellent performance for the price, and a good value for almost any user.